Happy Phirr Bhaag Jayegi is the second movie is the second installment of Happy Bhaag Jayegi, this time the action moves from Pakistan to China. When Professor Harpreet Kaur lands in Shanghai, the last thing she would have on her mind is getting kidnapped. A crazy comedy of errors unrolls as the ‘Happy’ gang – Bagga, Guddu, Happy and Usmaan Miyaan – navigate through China while Harpreet, aka Happy is caught in the crosshairs. Bollywood Hungama: On the whole, HAPPY PHIRR BHAG JAYEGI turns out to be a worthy sequel. Despite the loose ends, it manages to make audiences laugh thanks to its funny dialogues and situations, clean humour and bravura performances. At the box office, it will turn out to be a decent fare. NDTV: The primary problem with Happy Phirr Bhaag Jayegi isn’t that it is pure drivel. That is something that could be pardoned in Bollywood laugh riot. But here, the hilarity quotient is low. The precursor had delivered on at least a part of the promise inherent in the quirky premise. This one goes through the motions without ever coming close to finding a genuine rhythm. Koimoi: All said and done, Happy Phirr Bhag Jayegi is one of those films in which you can have fun with your entire family. It has moments which will make you laugh even if you’re watching it for the nth time on television years from now. Whatever is the fate of this film, I want a spin-off film of Bagga & Kaylula. Indian Express: The smartest thing you can do with a caper like this, when you are trying to stuff in all kinds of improbable things, is to keep it brisk and pacy. It is two hours and some, but feels much longer. Happy Phirr Bhag Jayegi has just a few places where you crack a smile, especially when you see Jassi Gill as the Chinese-speaking ‘desi’ trying to help his country-folk out. Gill is about the only tolerable thing in this enterprise. GulfNews: While the plot twists in this mad caper is predictable, what finally wears down this comedy is its interminable, long-winded length. But it has some smart, sassy one-liners. They don’t try too hard at the humour and that has its own appeal. You are likely to walk out of cinemas with a smile on your face, but that smile could have developed into a hearty grin had the length been snipped by at least 20 minutes. But it’s still a jolly ride for the viewers. Times Of India: Happy Phirr Bhag Jayegi is just as good as HBJ, if not better. It has good music too and for a change, the songs actually add value to the storytelling process. This film takes the ideas of the original and it adds a zany new twist to the proceedings. The goofball humour gets a little over-the-top at times, but that’s exactly what works for this madcap comedy. AINs: This sequel steals your heart once again. 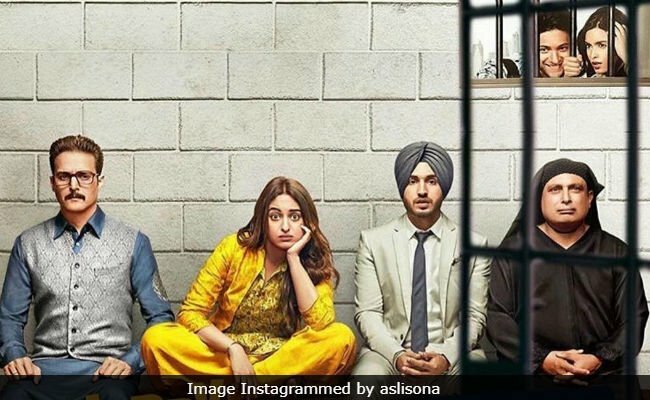 "Happy Phirr Bhag Jayegi" combines a little mistaken identity, romantic comedy and xenophobic musing into one of those genial films where you know everything is going to turn out all right in the end, this film might not have the spark of its predecessor but nevertheless, it is light-hearted enough to bring a smile to you face.